One of the great attractions of birdwatching is its simplicity. There are no set rules for birdwatching, no minimum requirements to meet and no real expectations other than spending some enjoyable time with the birds and your friends. This simplicity is further emphasized by the fact that very little equipment is required, even for the beginning birdwatcher. In fact, novice birders are sometimes at a loss when it comes to what equipment is required to go birdwatching. Well, the good news is that the equipment necessary to enjoy a day out with the birds is minimal and compared to many other hobbies or sports, the cost is pretty low. The bad news is that once you get hooked on birdwatching, you will want to get the fancy (and expensive) equipment. A good set of binoculars is an absolute requirement for birdwatching. It is possible to go birding without them, and some people do. But leave home without them and, unless you are an expert birder and can identify every bird by sight and sound, it won’t be long before your hands are itching to wrap themselves around a pair of binoculars. Since people can’t fly or even run through the forest very quickly, we cannot bring ourselves to the birds. So, we use binoculars to bring the birds to us. You don’t need an expensive pair of binoculars, especially if you are a beginner. The best way to start out is to borrow a pair, use them for a day and see how you like them. There are many styles of binoculars to choose from and finding a pair you are comfortable with will mean the difference between an enjoyable outing and a frustrating one. A decent pair of binoculars will set you back $150 to $200, but those will last you for several years, longer if you take really good care of them. 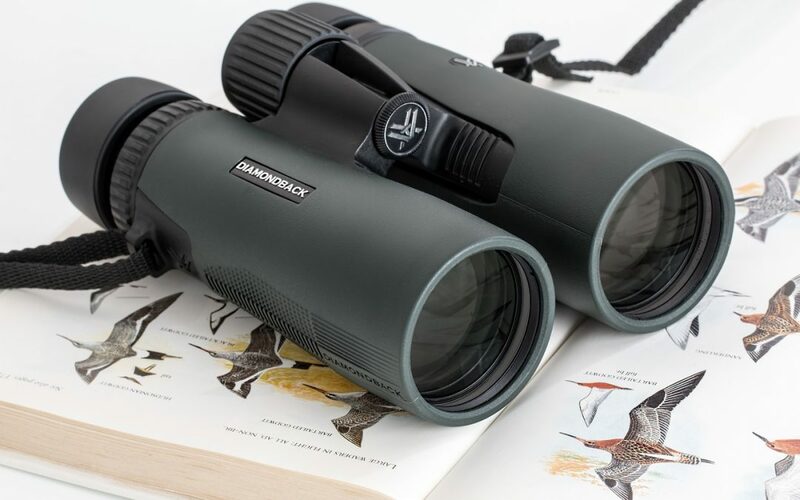 It is possible to spend over $1000 on a state-of-the-art pair but it’s best to stick with the reasonably priced pair, at least until you get a better feel for what kind of binoculars you like. There is nothing more frustrating for the novice birdwatcher than seeing a tree full of beautifully colored birds and not being able to identify any of them. This is where the field guide comes in. Birdwatching has such a long and rich history, and is such a popular hobby, that there really isn’t a spot in North America (and many other places in the world) that doesn’t have a detailed field guide to the birds of that area. A field guide is simply a book which describes all of the birds in a particular area. There is usually one page per species, with an illustration of the bird, a description of their plumages, information on their habitats and a range map showing where they normally occur. There are several national guides which will cover the entire United States (or Canada, or Mexico, or England, just to name a few examples) and in the case of the USA, there is also a field guide for each state. Field guides are indispensable for novice birders, or even for expert birders who are new to a region where the birds are different from those back home. Once you become comfortable with how the field guide is laid out, and how to use them to identify a specific bird, it won’t be long before you find yourself with an entire collection of field guides, just like every other birdwatcher. Birdwatching field guides can be purchased in almost every bookstore. In fact, the larger bookstores will often have an entire section devoted just to birds and birdwatching. A checklist is similar to a field guide in that it lists all of the birds which are found in a particular area. But unlike the field guide, there is not much more information included on the list, unless it’s a list for an area where the birdlife has been well studied, in which case the list will also have information about when each species is present and its status, i.e., a breeding bird, a migrant or a year-round resident. Checklists are very useful for keeping track of the birds you encounter during a birding trip. All checklists can be folded and slipped into a pocket or between the pages of the field guide. Whenever you see a bird, you simply find the entry for that species and “check it off”. Most birders keep a supply of checklists handy. A good way to verify if you are riding in the car of a birder is to check to glove box; if it’s crammed full of both used and unused checklists, you’re riding along with an experienced birder. Good for keeping the sun off your head during birding trips. This is important because birding trips always last longer than first planned. Many birdwatchers have uttered the phrase, “We’ll just stick to the trail”; very few birdwatchers have actually followed that advice. Some really neat bird always draws them off the trail and into the (inevitably) wet and muddy undergrowth. Or dark woods. Or swamp. Or sand dune. Good for carrying your field guide, extra checklists, hat, dry socks and water bottle. Not every birder carries a notebook but novice birdwatchers find it useful to record their observations. A good way to learn bird identification is to examine a new bird closely, then write down a detailed description of what you saw in the notebook. This way, when the bird flies off, you can take your time going through the field guide, comparing the information in the guide to your description of the bird. This list pretty much covers everything a novice birdwatcher will need for a birding trip. Experienced birders will often carry additional items with them, as their interest in birds grows and as their personal budget permits the purchase of other useful equipment. For a discussion of the kinds of items experienced birders will bring with them, see the article title “Extensive Field Trip Equipment List”.